Eltima Serial over IP Connector allows you to share up to 255 serial port devices over TCP/IP network turning your computer into low-cost terminal server. As the result, any serial port device connected to COM port could be accessed from anywhere in the world as if it is attached to local PC. When the attached serial port device sends communication data it will be actually transmitted over TCP/IP network. Such behavior is achieved due to the use of virtual serial port technology which emulates standard COM ports. In that case Windows OS treats virtual serial ports in the same way as real ones therefore you are no longer limited to just two real ports (any number of physical ports you have) per system and may create COM port connections without occupying any real serial port. 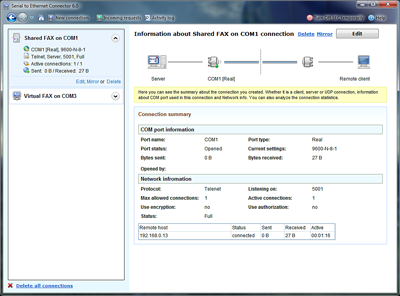 Serial over IP Connector provides the ability create several connection types for three main purposes: share serial port for incoming connections (Server), connect serial port to remote host (Client) and share serial port using UDP. Starting from version 4.0 Serial over IP Connector enables you to select data transmission protocol, which will be used for connection: RAW data transmission algorithm or Telnet (RFC 2217) protocol. License/Copyright Software license agreement This user license agreement (the "AGREEMENT") is an agreement between you (individual or single entity) and ELTIMA Software. The SOFTWARE is the property of ELTIMA Software and is protected by copyright laws and international copyright treaties. Demo version If you accept the terms and conditions of this AGREEMENT, you have certain rights and obligations as follows: You may: 1. Install and use the unlimited number of copies of the Demo VERSION. 2. Use one or more copies of the Demo VERSION for evaluation purposes only. 3. Copy and distribute freely the Demo VERSION (see 'DISTRIBUTION'). You may not: 1. Sublicense, rent or lease the Demo VERSION or any portion of it (unless you are an authorized reseller/partner). 2. Decompile, disassemble, deflash, reverse engineer or modify the Demo VERSION or any portion of it. Distribution: You are hereby licensed to make as many copies of the Demo VERSION as you wish and distribute them to anyone provided that all files are intact. You must distribute the install form of the Demo VERSION (not the files resulting of an installation). You are not allowed to sell the Demo VERSION (except for shipment and handling charges). Computer's Magazines are authorized to distribute it on any Cover Disk or CD-ROM without any permission. Please inform us by e-mail each time you distribute the Demo VERSION. Warranty disclaimer: The SOFTWARE is supplied "AS IS". ELTIMA Software disclaims all warranties, expressed or implied, including, without limitation, the warranties of merchantability and of fitness for any purpose. The user must assume the entire risk of using the SOFTWARE. Disclaimer of damages ELTIMA Software assumes no liability for damages, direct or consequential, which may result from the use of the SOFTWARE, even if ELTIMA Software has been advised of the possibility of such damages. Any liability of the seller will be limited to refund the purchase price. License/Copyright Software license agreement This user license agreement (the "AGREEMENT") is an agreement between you (individual or single entity) and ELTIMA Software. The SOFTWARE is the property of ELTIMA Software and is protected by copyright laws and international copyright treaties. Demo version If you accept the terms and conditions of this AGREEMENT, you have certain rights and obligations as follows: You may: 1.